Offering you a complete choice of services which include CBSE Class 1 DVD Maths and Environmental Science ( Evs ), CBSE Class 2 DVD Maths and Environmental Science ( Evs ), CBSE Class 3 DVD Maths and Environmental Science ( Evs ), CBSE Class 4 DVD Maths and Environmental Science ( Evs ) and CBSE Class 6 DVD Maths and Science. 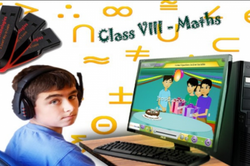 Our range of services include Class 7 Usb Maths And Science, Class 1 USB Maths and Environmental Science ( Evs ) and Class LKG Worksheets Maths, English and Evs. Pioneers in the industry, we offer Class UKG Worksheets, Class 1 Worksheets, Class 2 Worksheets, Class 3 Worksheets Maths English and Evs and Class 5 Worksheets Maths, English and Evs from India.